As we slip deeper into the euphoria of what is now the longest bull market on record, resulting in a deluge of corporate "zombies" , the initial public offering market is similarly slipping into a noxious trance of its own, welcoming to U.S. exchanges record numbers of companies that lose money. According to a new report by the Wall Street Journal, a record number, or 83% of US listed IPOs over the first three quarters of 2018, were companies that lost money in the 12 month prior to their going public. And because it's this easy to conjure money out of thin air, new listings have surged. During the first three quarters of 2018, $50 billion in IPO money has been raised by more than 180 companies. This puts this year on track to be the busiest year for IPOs since 2014. A great example is the SurveyMonkey IPO, which was up more than 40% last week, despite the fact that it hasn’t ever posted a profitable year and lost $24 million in 2017. The often discussed pot stock Tilray is another such example: after listing in the United States over the summer, shares are up more than 740% in the midst of a larger boom around marijuana stocks. Or, take for example Solid Biosciences, which not only has never generated earnings – but has never generated revenue – and disclosed to the market that one of its clinical trials was put on hold before its IPO in January. This was rewarded by the company raising $144 million and its stock almost tripling. Part of the demand for IPOs likely comes from the fact that bigger name private companies, like Uber, have decided to stay private longer than companies at their stage have traditionally done (we reported on Uber's most recent $312 million quarterly loss in May). 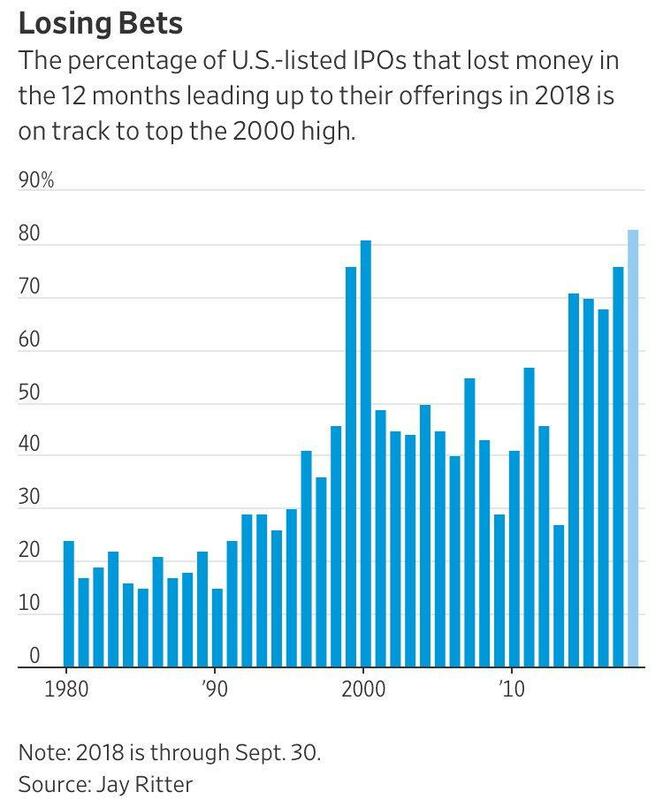 Such levels of non-profitable IPOs were only been one time before: during the peak of the dot com bubble. Back in 2000, 81% of companies going public were unprofitable. This number is now 83%. In addition to technology companies, many biotech companies – often money losing entities while they prepare for, and execute, clinical trials – have helped push this number higher. But this hasn’t stopped investors from comparing the current environment to the dot com bubble. In 2000, 14% of tech companies that listed were profitable. This compares to 19% so far this year. Of course, the dot com bubble watched many of its once-darling companies go bust and file for bankruptcy. During the next recession, history will once again repeat itself. And yet that's precisely what everyone is doing. Of course, not every single IPO has done exceptionally well this year. ADT fell 12% on its first day of trading and shares in the company are down more than 30% since its IPO, which priced at the low-end of its initial target range earlier this year. Snapchat is also a great example. The stock is down almost 50% from its IPO price. For the most part, however, companies can get away with the narrative that they will eventually be profitable and that investors' patience may be rewarded for investing at these early stages. However, if the broader market slips into recession, or if the panic buying slows just a little - or god forbid, turns into panic selling - a stark reality check could be in the cards for those believing there’s money to be made from companies where there is actually no money being made. The biggest risk was summarized by University of Florida finance professor Jay Ritter: "The problem with young growth companies where investors have built in really optimistic assumptions is if the company doesn’t deliver, it can get revalued in a heartbeat."